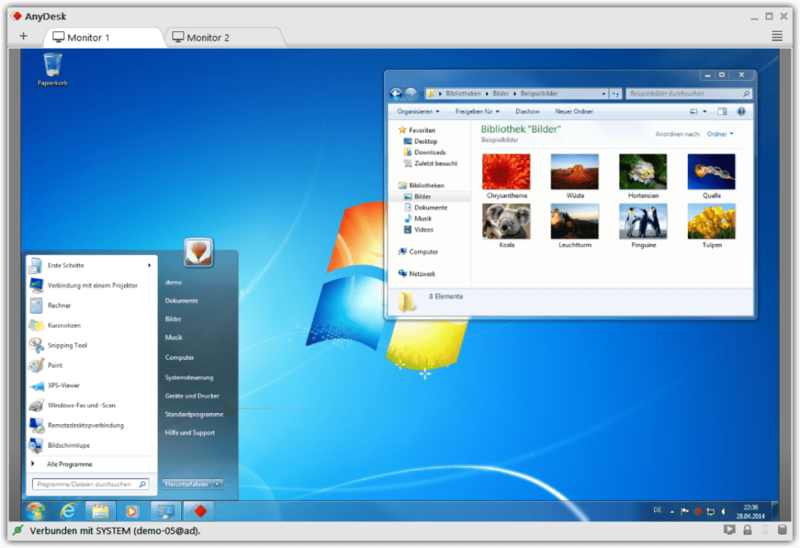 AnyDesk is a remote desktop application with a focus on blazing-fast speeds and ease of use. Its minimal interface exists almost entirely to connect you to your work or home computer and puts the focus on what you're using the software for: writing the same files encoding the same videos and doing all of the same things you would even if the computer you normally do them on is 30 miles away. Whenever you log in to a remote computer with AnyDesk viewing its screen clicking on its files and using the software it has installed the result is sent back to you in real time as video. This is standard for remote desktop applications but AnyDesk uses DeskRT a video codec specialized for the purpose of encoding video of computer interfaces. This means that it runs more smoothly and closely to what you'd see at the computer itself. Combined with rock-solid server technology this means that AnyDesk provides super-fast speeds for anything short of playing video games whether you need it during the day or at 3 AM on a stormy holiday in the middle of large-scale Internet attacks. You know how remote desktop used to be: slow and tedious. For the development of AnyDesk, we took a step back and asked ourselves fundamental questions. How should remote desktop work? What is feasible with modern computer hardware? AnyDesk was designed from the ground up to be ground breaking. At its core is DeskRT, a new video codec that is specifically designed for graphical user interfaces. That's why AnyDesk is one leap ahead. AnyDesk closes this gap by intro­ducing DeskRT, a video codec specifically designed for graphi­cal unser inter­faces. Exploi­ting the special proper­ties of GUI image data (e.g. large areas of the same colour, high con­trasts, sharp edges, repeating patterns in the time and spatial domain, or the linear trans­lation of image con­tents), DeskRT is able to bring about very high image quality and low res­ponse times for the user. What do you think about AnyDesk? Do you recommend it? Why?